*I’m including the ‘*’ as this isn’t specifically a maternity project. 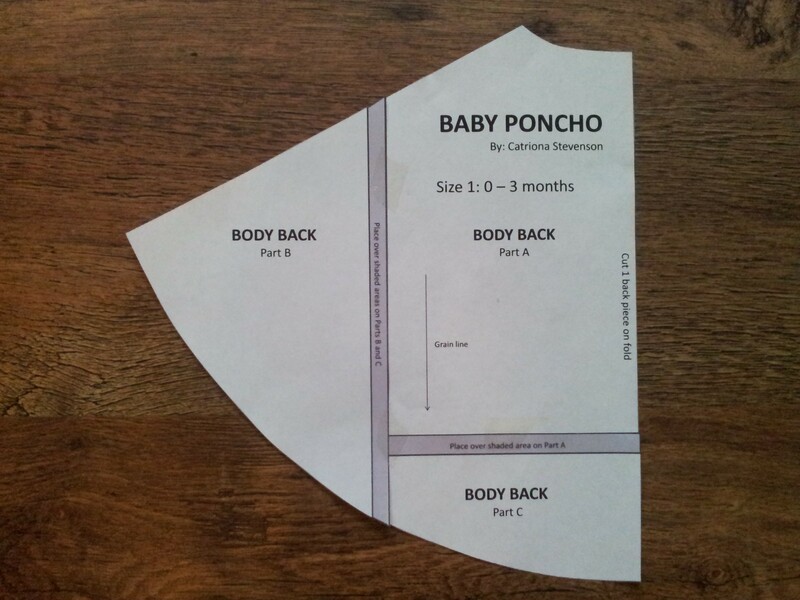 But the finished article is suitable for both maternity and regular wear so is a good project for anyone to try. I bought this jumper in a charity shop about a year ago, for the enormous price of £1. Big spender, me 😉 I just loved the colour of it and I’m a fan of cabled jumpers in general. But I didn’t really like the neck, it was just that little bit too tight to be comfortable for me. So after wearing it once it hit the back of the wardrobe and has been there ever since. Which is a shame as I still like the colour and I still like the cables. So it was time to transform it into something I will wear. 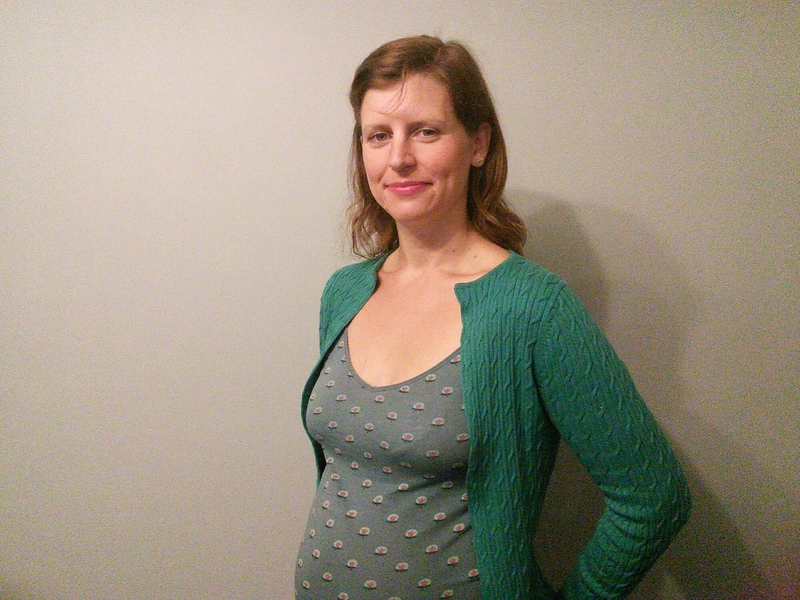 I could have just taken off the top and made it into a crew neck jumper, but by opening up the front as well and making it into a cardigan, I’m able to wear it now over my rapidly expanding bump, and it will be great for when baby comes and I’ll be spending hours breastfeeding. The transformation was actually very easy. 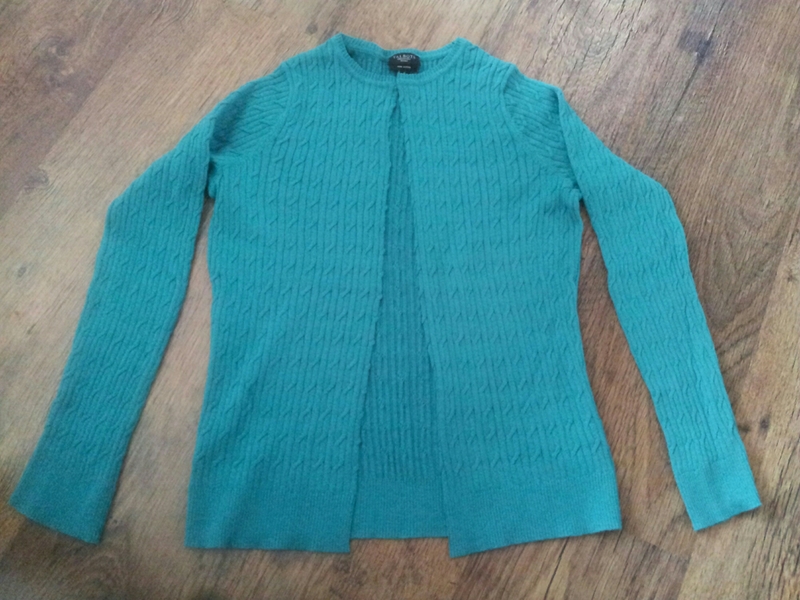 First thing I did was identify the centre of the jumper, which turned out to be the centre of a cabled row. 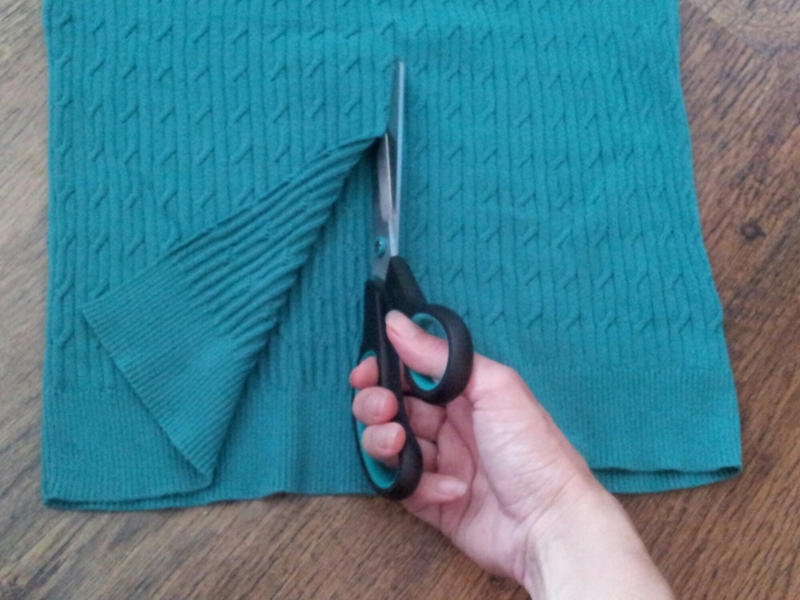 Then I very carefully cut up the front of jumper using a nice sharp pair of scissors. Don’t be tempted to use general purpose scissors, as it’s the sharp edges which give you a clean cut and stop the fabric from shifting. 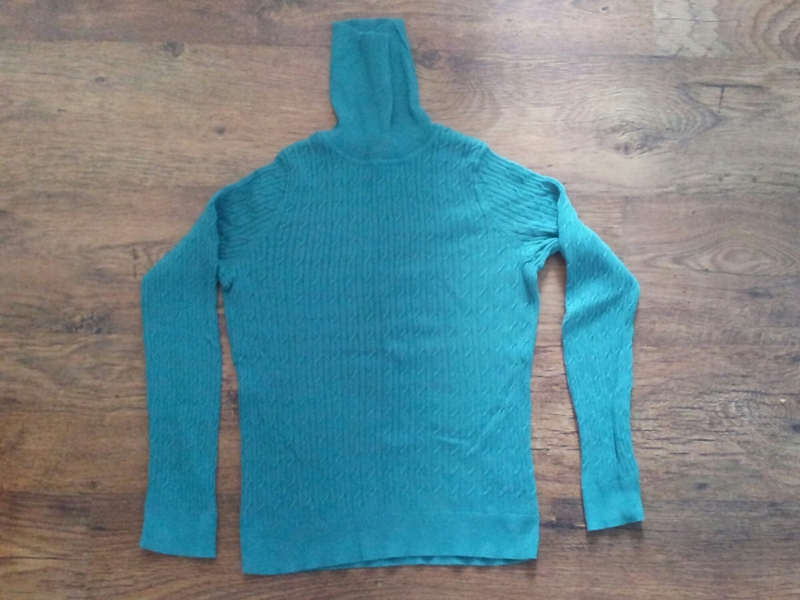 I only cut as far collar, as I have a faint notion of reusing the ribbing from the neck, but you could quite easily open up the whole of the front. As you can see from the photo, there was quite a thick band joining the body of my jumper to the neck. 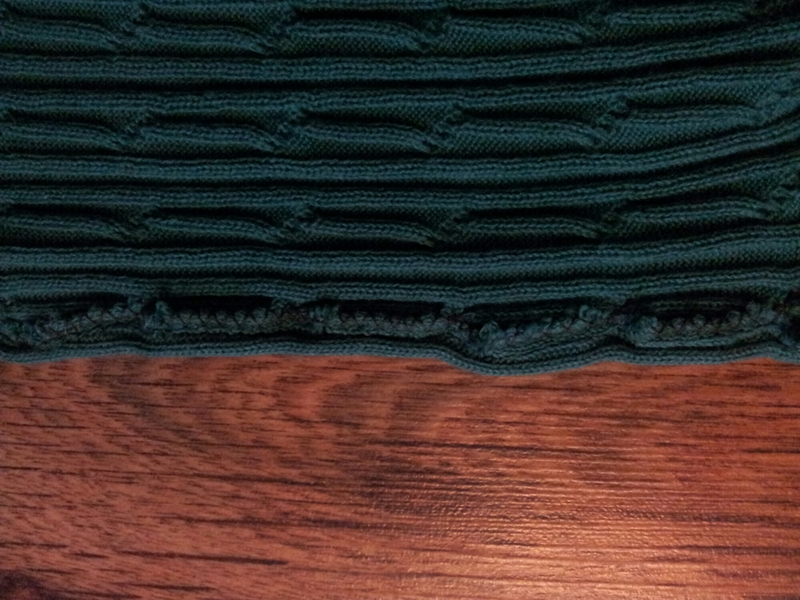 I decided that this would become the new top edge of my cardigan, so I cut parallel to its top edge, leaving about 1cm of ribbing to finish off the neck line. Looking like a cardigan already! Next step is to finish off the cut edges to stop them fraying. 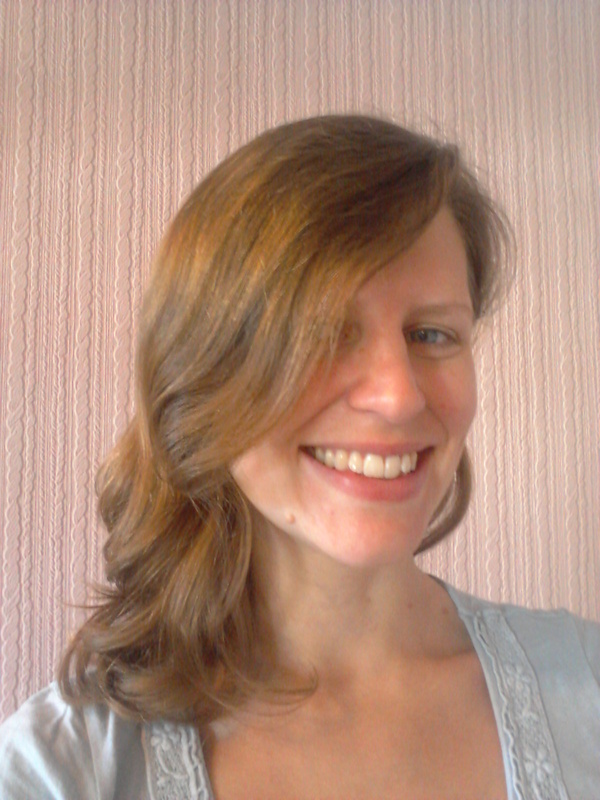 I sewed along each front edge and around the neck using a zig zag stitch. Alternatively you could use an overlocking stitch as both will seal the raw edges. I found that the zig zag stitch left the edges with a slightly frilly lettuce effect as it got a little stretched going through the machine. 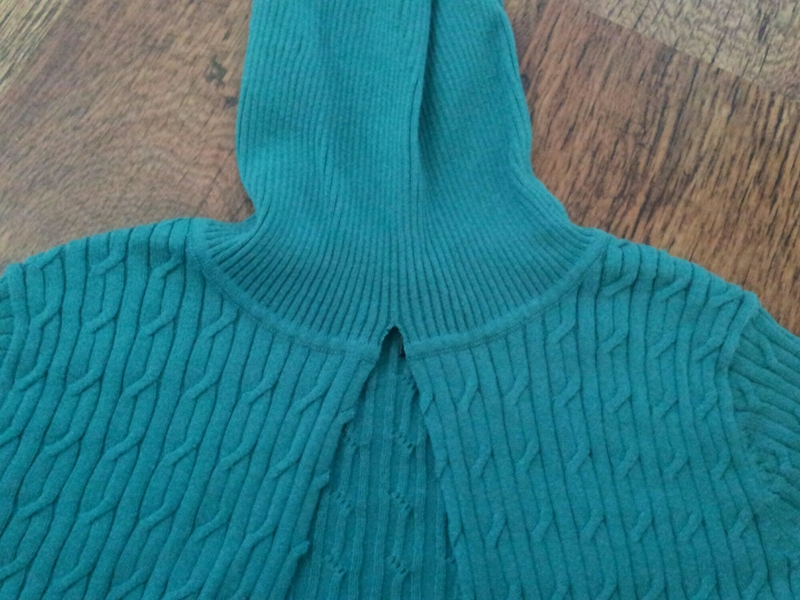 If this happens to you, don’t worry about it as you can reshape the edges at the end when you press your cardigan. One thing to be aware of when finishing your raw edges, is that there will be a lot of little pieces of fluff will come off your cardigan and some of these will end up in your machine. Once you’ve finished your raw edges it’s a good idea to clean out all the fluff to keep your sewing machine running smoothly. The final step was to create the new finished edges. To do this I pinned under the raw edge, so that a knit row was the new edge and folded far enough over that I could sew up the purl row to hide the stitches. I used a straight stitch to sew the seam, and I sewed very slowly to make sure the same amount of fabric was sewn under the whole way down. I also found I had to take the pins out at least 5 – 7cm from the needle in order to get the best result. At the neck seam I decided to finish off my cardigan by hand as, unlike the front edges, there was nowhere to hide the stitches and I didn’t have any thread that closely enough matched the colour to blend in. So I used a whipstitch along the inside of the thick neck band, making sure to go slowly and check that my stitches weren’t coming through to the right side of the fabric. As a final touch I also did some hand finishing along the front edges. 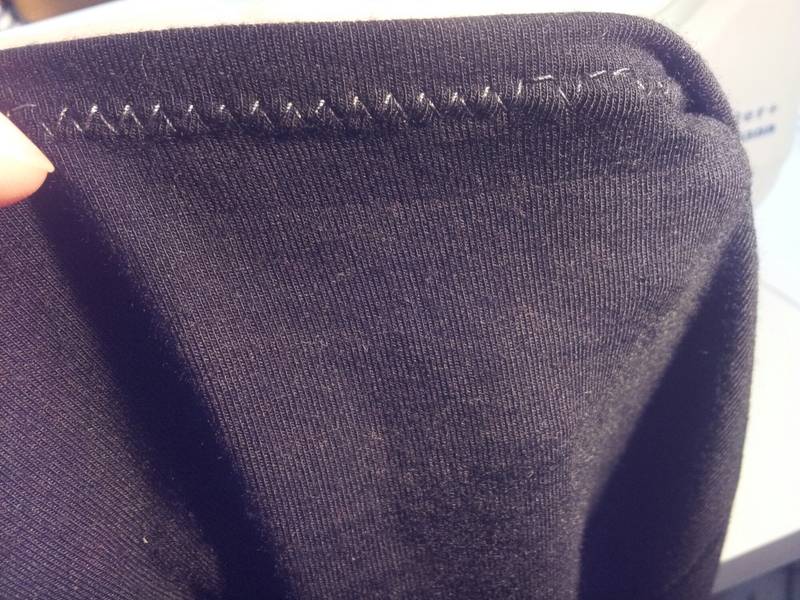 However if you were converting a jumper made entirely in stocking stitch you could skip this step by sewing a double line instead. As I was trying to hide my stitches I decided that a hand finish would be neater and more invisible. At every cable I simply put in a few stitches joining the wrong side of the cable to the raw edge. This is enough to keep the raw edge away from the finished edge, and to stop it from curling around into view when the cardigan is being worn. 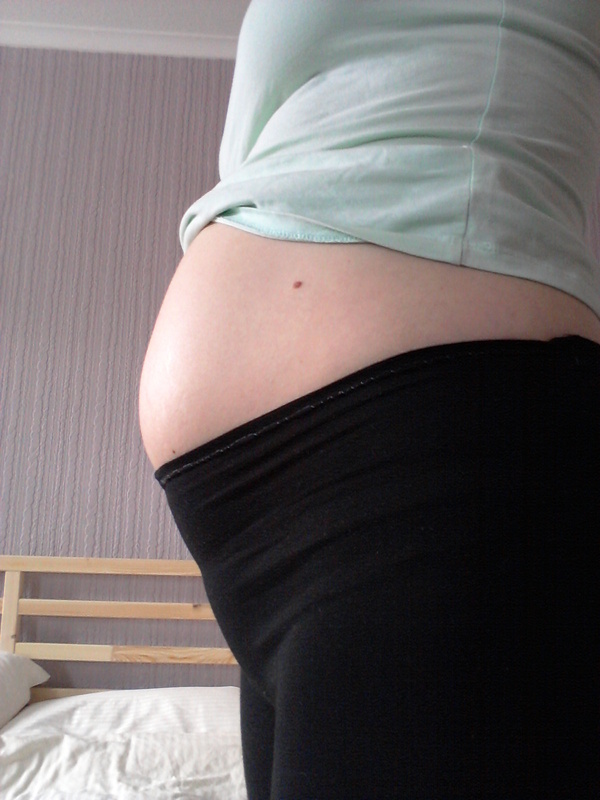 As I mentioned here I am having real trouble finding any trousers that fit over my low down baby bump. 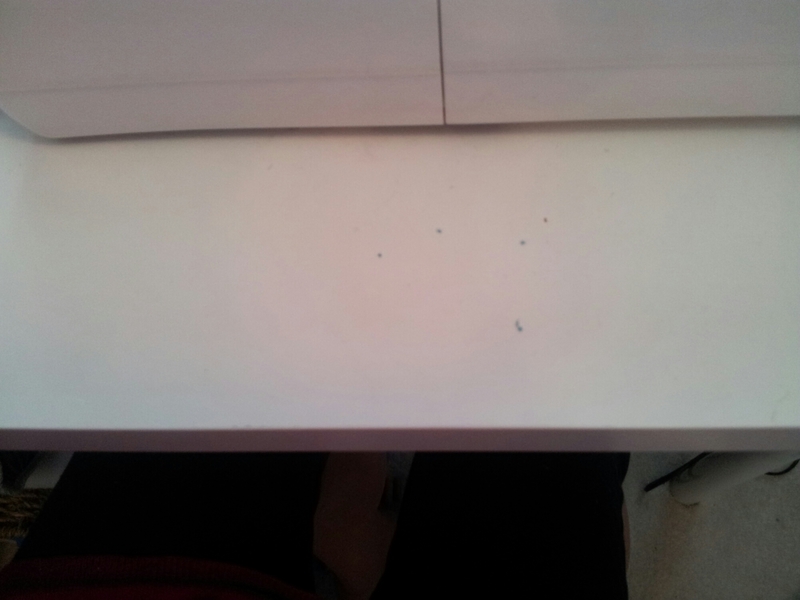 Even the type that are cut incredibly low are a bit too diggy the second I sit down. And anything that does fit when I’m sitting down, will fall off when I stand up. Not really the best look to be flashing my pants at everyone followed by a pulling up the trousers dance! So I thought I’d give leggings a go in the hope that the nice soft fabric will work against my poor squished bump! But have you seen the price of some pairs of maternity leggings? I mean really, for what is essentially exactly the same product with a little more fabric round the waist, I’m not sure why they cost so much more. (OK, so in the grand scheme of things they aren’t expensive, but I still object on principle.) And it also annoys me that most shops only stock their maternity clothes online. At a time when my body is a different shape at any two points throughout the day, never mind week to week, I’d rather spend my money on something I can try on first. So I picked up a pair of regular leggings, which I knew fit eveywhere except my tummy, for £3, and set about turning them into maternity leggings. It was actually a very simple transformation, all I had to do was remove the elastic from the front half of the leggings and sort out the waist band. Easy! *At this point I’m going to apologise for the quality of the photos, my camera was having issues with the colour balance, and the dark thread on black fabric was really hard to capture. I’ve used dark grey thread instead of black in the hope that it will show up (at all!) but I’ll also explain each step along the way so hopefully it’s clear what I’m doing. 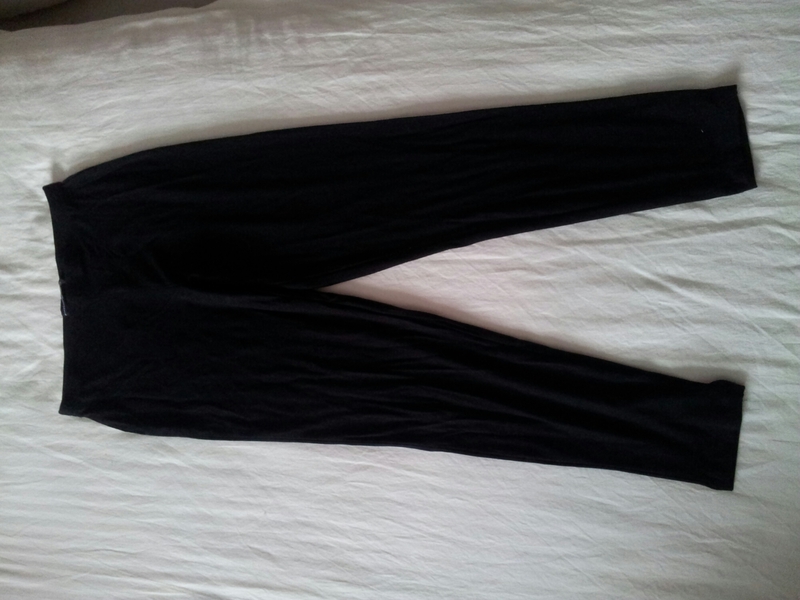 The first step was to take a look at how the waistband of the leggings was constructed. In my case the elastic was sewn into the seem so it was a little (but not much) more compicated than if the elastic was free to move in it’s own casing. In that case all you would have to do would be to fix the elastic at the side seams, open up a little hole to remove it from the front half, sew up the hole and you’re done! 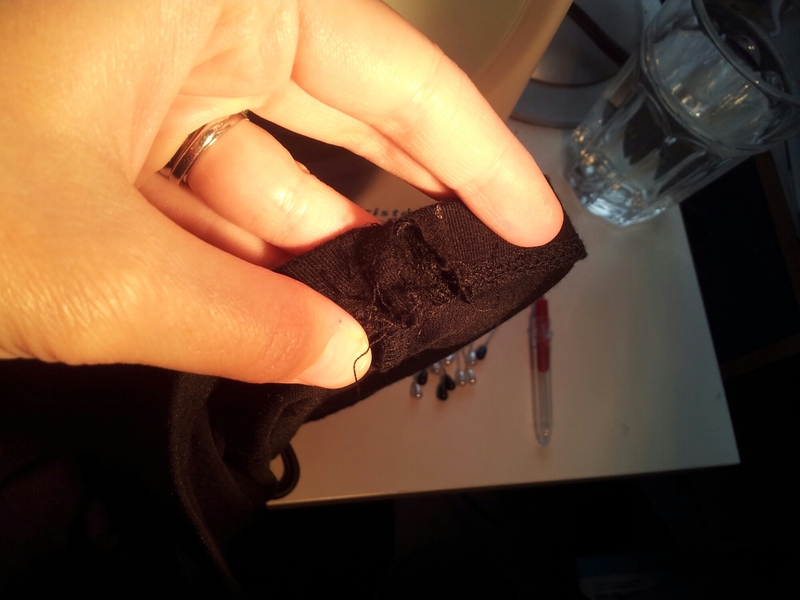 But if your elastic is sewn in like mine, then start by sewing a straight line to reinforce the ends of the elastic. 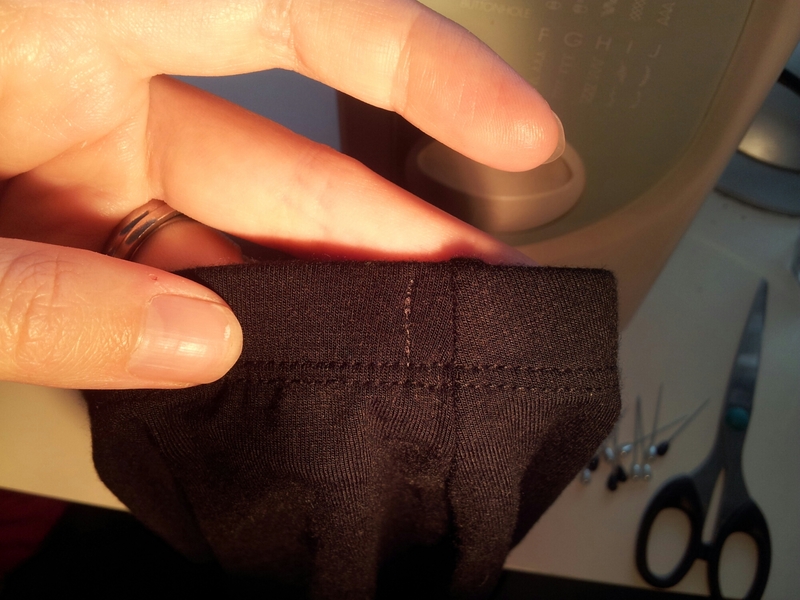 Do this at the back side of the seam, so that you can open up the waistband at the seam for access to the elastic. I used a triple stitch to make it as strong as possible. Repeat the process at both sides. Then carefully unpick the side seams to give you access. Now we’re going to unpick the waistand along the whole front of the leggings. 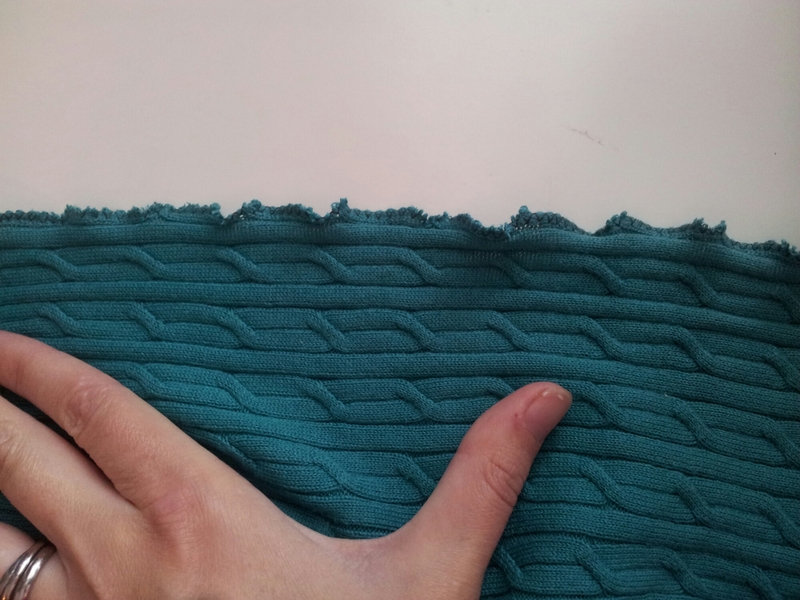 Do this carefully with a seam ripper to not damage the fabric. Once it’s opened from side seam to side seam and the elastic is free, you can cut the elastic out. At this point I tried my leggings on, and they fit perfectly. The remaining elastic at the back was enough to keep them fitted, but they were soft enough round the front to be really comfortable even when sitting down. Finally I re-sewed the waistband. If you don’t want to include this step you don’t have to. As the fabric for leggings is usually jersey, it doesn’t need to be finished as it won’t fray. And if you don’t plan on wearing them with some little cropped top then noone will be any the wiser! I will finish off the waistband to show you how to do it. Basically you’re just resewing along the same line that the fabric was stitched before. 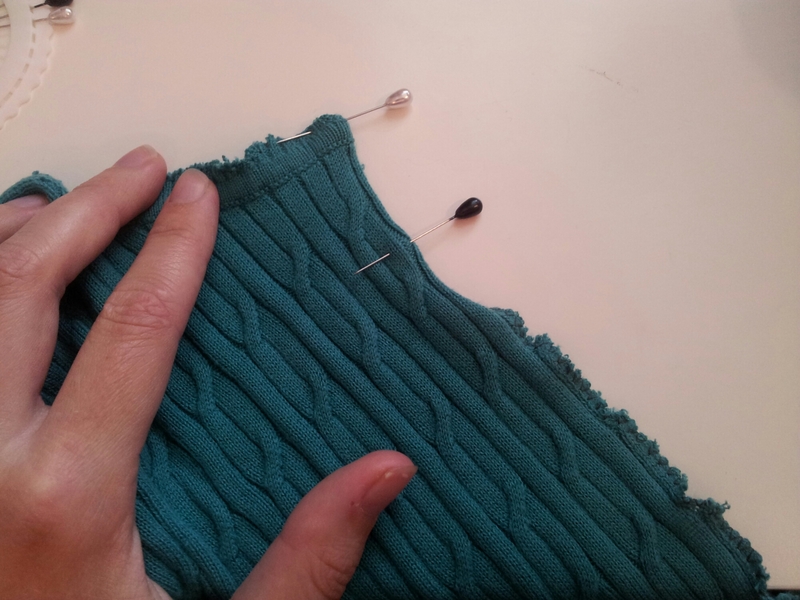 If, like me, you don’t have an overlocker/serger then you can easily do it with a zigzag stitch. (I’m afraid I’ve never used an overlocker so I can’t tell you how to do it that way) The zigzag stitch is necessary as you want the seam to have some stretch, otherwise it defeats the purpose of this project! 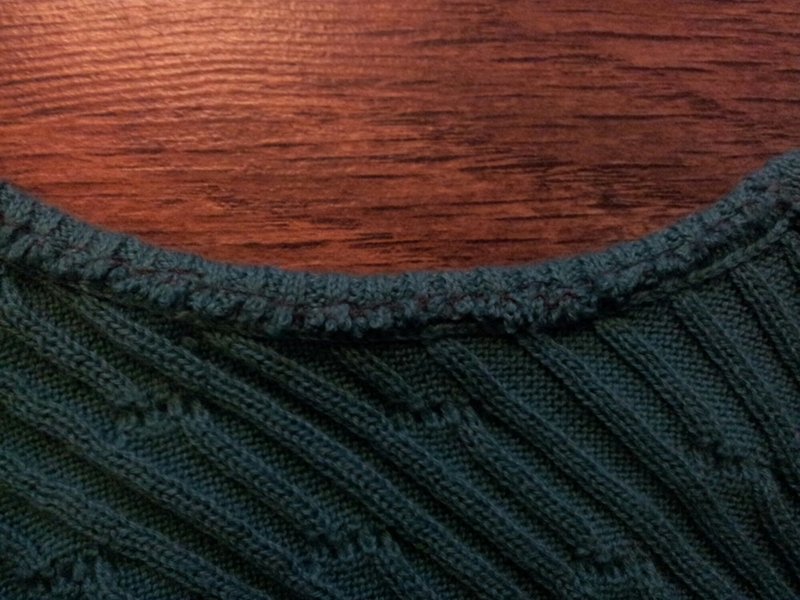 A basic straight stitch would either not stretch, or would try to do so and break.